The cornea is the clear window of the eye. It is a very delicate structure which is less than a millimetre thick. In order to be transparent, the cornea has no blood vessels. This makes the cornea vulnerable to injury and infection, and results in a slow healing response to deep wounds. A corneal sequestrum is a part of the cornea which has died off and which is then rejected by the remaining healthy cornea. Most sequestra (as more than one sequestrum is known) affect the centre of the cornea. Corneal sequestra are usually pigmented in different shades of brown and may vary in appearance from subtle bronze staining to very obvious dark plaques. In some patients, blood vessels grow into the cornea in response to the sequestrum and a reddish rim may surround the pigmented plaque. In many affected patients, their tears will also be darkly pigmented and brown to black discharge may crust on the eyelids. Is a corneal sequestrum a problem for affected cats? Overall, the answer to this question is yes. In their very early stages, corneal sequestra will not cause pain or visual impairment but with time corneal ulceration (wounding) develops, and patients will show intermittent signs of eye pain such as blinking, squinting, weeping and light-shyness. Occasionally patients will show signs of a sequestrum only after several episodes of apparently spontaneous corneal ulceration. Corneal sequestra can become infected, and this may lead to loss of the eye in the absence of rapid treatment. Chronic injury has been identified as a possible cause of sequestrum formation and especially abnormalities of the eyelids such as inward turning of the eyelids and eyelashes. However, even today, it is not known why the majority of patients develop corneal sequestra. Many theories have been investigated and herpesvirus (one of the cat flu viruses) has been identified as a possible cause in crossbred (domestic short haired) cats. 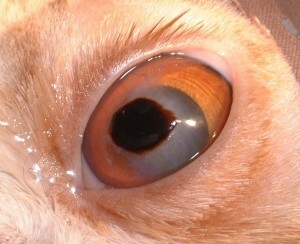 However, most corneal sequestra are seen in purebred cats such as Persians and British Short Hair cats. It is possible that the special shape of the faces of these patients is associated with the problem. They generally have big bulging eyes which often have a poor blinking response. Herpesvirus does not generally appear to be related to sequestrum developments in purebred cats. Abnormalities of the tear film such as a poor quality or quantity of tears are also considered to be involved in some cases. What treatment options are available if my cat has a corneal sequestrum? Conservative treatment with antibiotic and lubricating ointments to reduce irritation and prevent infection until the eye has shed the sequestrum by itself. Surgical excision of the sequestrum and placement of a soft contact bandage lens. Surgical excision of the sequestrum followed by a grafting procedure to provide support for the affected area of cornea and to reduce the risk of the sequestrum coming back. In general, it is unlikely that continued conservative treatment will be recommended, as this is usually associated with prolonged periods of eye pain for the patient. Furthermore, ongoing monitoring and veterinary care will be required to try and reduce the risk of infection or rupture (bursting) of the cornea. This is a risk as the sequestrum may spread deeper. The cost advantage of not proceeding with surgery usually does not outweigh the prolonged care and discomfort for patients suffering a sequestrum, and the result of surgery may be less good with later intervention. In our experience, surgical removal of the corneal sequestrum under the operating microscope is the treatment of choice. Given the depth of the lesion and the risk of retention of some pigment in the cornea after surgery, an additional grafting procedure may well be recommended. Grafting procedures involve the placement of a piece of conjunctiva (the lining of the white of the eye) or other tissue into the wound following excision of the sequestrum. Grafts are usually stitched into place and will lead to a partial impairment of corneal transparency. However, the eye should still retain useful vision. What does surgery for sequestrum removal involve? Removal of corneal sequestra is carried out under general anaesthesia with the help of the operating microscope. The area around the eye is clipped. During the anaesthetic, the patient’s heart rate, blood pressure and blood oxygen concentration are monitored and a fluid infusion is given intravenously to maintain good blood circulation. Once the sequestrum has been removed, the surgeon will usually either place a contact lens or place a graft (see previously mentioned). Following the surgery, the operated eye is likely to be slightly sore and many cats will only partially open it for a few days. What aftercare will be required? Post-operatively, the patient needs to wear an Elizabethan collar to prevent damage to the wound by rubbing or scratching. Gentle cleaning of the operated eye with wet cotton wool twice daily is recommended. An antibiotic ointment is generally applied to the eye for approximately ten days post-operatively. A short course of antibiotic tablets and painkillers may also be given after surgery. The use of false tears or other lubricant preparations may be recommended long-term in some cases, usually to be applied once or twice daily. How successful is surgery for removal of a corneal sequestrum? Surgical removal of corneal sequestra is a very successful surgery in uncomplicated cases. The main risks of the procedure are wound infection and loosening of the graft. On occasion, a second procedure may be required to achieve a satisfactory result. Fortunately, the loss of an eye due to complications or progression of the disease after surgical sequestrum removal is very rare. Surgery for sequestrum removal and placement of a graft aims at reducing the risk of sequestrum recurrence but cannot guarantee that the same eye will never be affected with another sequestrum. Can my own veterinary surgeon remove the corneal sequestrum? Removal of a corneal sequestrum is a procedure that requires a skilled and experienced micro-surgeon, equipment for magnification and illumination, and fine surgical instruments that will not damage the delicate tissues of the eye. For this reason most general practitioners will recommend referral to an ophthalmic specialist for treatment of this condition. Do I have to return to the eye specialist for the aftercare? After an eye has developed a serious disease which has required a major procedure, it is best to have its progress checked by the specialist. The number of revisits will depend upon the severity of the problem and the post-operative progress. In many cases only two or three re-visits will be required. In more complex cases there may be a need to continue with further check-ups from time to time. Is my cat’s other eye at risk? Unfortunately, the other eye is also at risk of sequestrum formation and must be carefully monitored for this reason. At the moment no treatment is known that will reliably prevent sequestrum formation, but the use of ocular lubricants may be helpful in providing some degree of additional corneal protection.